Hi everyone, Happy Tuesday! I’m Taheerah and I’m beyond thrilled to be guesting on the WPlus9 blog today! I started by stamping the outline petunias using Distress Inks. With an almost-no-line technique in mind, I chose ink colours that were in line with the base colours that the flowers would be, then used clean clear water to ‘pull’ colour from the outlines to create a first wash of colour. I watercoloured the petals individually, drying in between, so they could keep their details and definition. Once my watercolouring was done, I took the solid center images from Petunia Builder and stamped them with PURE COLOR Dye Ink in Wild Mango. Just that one stamp adds so much depth to the image! I decided not to stop there though, and added some further details, before fussy cutting out my images ready to use on my card. There is a companion die for this set, but I opted to trim these out right up against the outlines. I added a sentiment and some leaves from Modern Petunias, adding a light watercolour wash to the leaves, before splattering the background for some subtle shimmer. All that was left was to adhere my flowers in place with dimensional adhesive and add a sprinkling of sequins and I was all done. I hope you’ve loved what you’ve seen here today, hopefully I’ve shown you that you don’t have to be a watercolour pro to make the most of these beautiful designs. My eternal thanks to Dawn for giving me a chance to appear here today – it really is a dream come true! Amazing, amazing, amazing! This is truly stunning!!!!!! So sweet, love that pop of yellow. What a lovely card - I can't get over the glorious white flowers - such a challenge for me to "color" a white flower! LOL The one side view petunia bud looks like a photo of a real one sitting in a pot on my deck - great job! 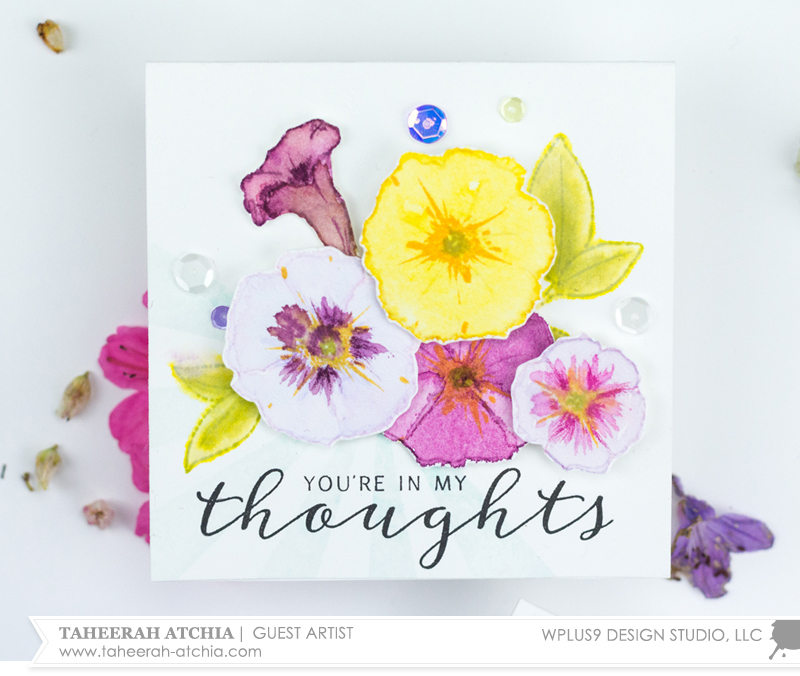 Love your blog, WPLUS9 and really enjoy getting to see these wonderful guest designers creating with your amazing stamps! Thank you! This is SO LOVELY!!!! 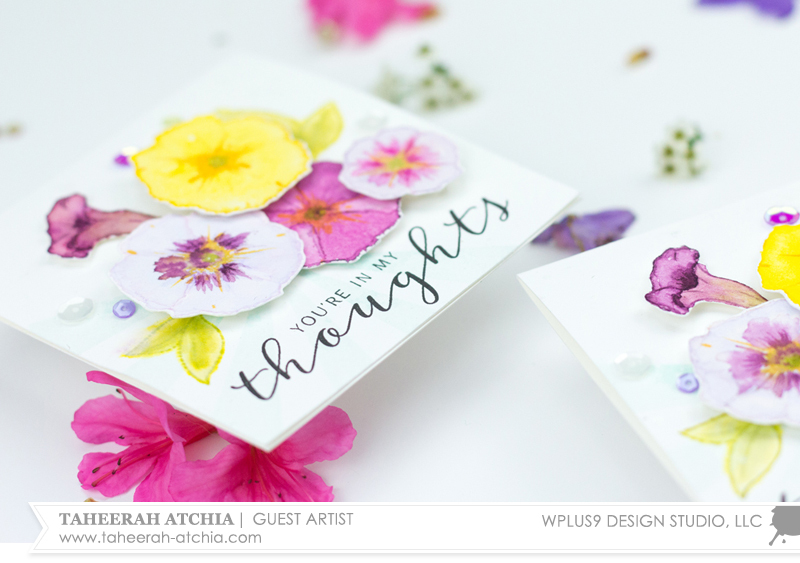 FLOWERS are a MUST for the card maker! The flowers coming our here on WPlus9 are FABULOUS here lately!!! ;)I CAN'T WAIT for my order to come in!! LOL SUPER JOB TAHEERAH!!!! SO LOVELY!!! This was such a great video. I have learned a few things again today! So beautiful Taheerah, I always love your cards AND wPLUS9. A win-win for me! TFS! I want to swear a little about how pretty this is. And your photography of it - wow . No other words. I hope you'll be a regular - WPLUS9 are beautiful stamps and youve realy done these sets justice. Wow, what a gorgeous card and lovely watercoloring! I loved the video, and I agree with Jenny that you should be a regular! Hugs! 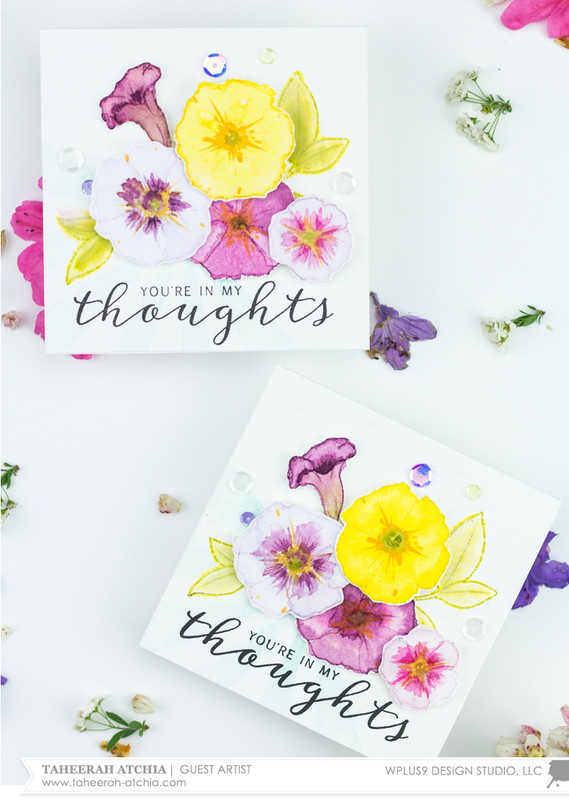 What's not to love about your glorious petunia cards?! As per usual you have considered every detail and come up with the perfect card - beautifully photographed too! Thank you for the informative video and I shall certainly be trying out your technique in the near future. I hope that we see you back on the Wplus9 blog again soon. What stunning flowers! You've outdone yourself Taheerah! What a fabulous technique you've taught us also! Very pretty!! I just purchased this set. Thanks for the ideas!! Beautifully colorful card ! Thank you for the video, it's always useful for me to watch them to learn the watercoloring technique as I'm only a beginner with it ;-)) ! This card is gorgeous and the colouring is so beautifully done! Thank you for a very instructive tutorial.I think it is so hard to get the petunias correct and you have shown me how to do it. I hope to see more of your wonderful work. Gorgeous card Taheerah! You make it look so easy! Beautiful and love how you paid close attention to the coloring of the bud for the realistic affect. Beautiful card and great watercoloring! Yay for TAHEERAH! Gorgeous projects! Beautiful card Taheerah. Your watercoloring is fabulous! And.. I learned about a new dimensional gel adhesive. I'll have to give it a try instead of foam adhesives. Thanks. Taheerah you have a great video voice ! I was waffling between these two set but after your video I'm getting both !! Taheerah is one amazing artist! So glad she's had the opportunity to share her talent with everyone here. Wonderful job attacking those florals with watercolor. And I love the video! Awesome coloring on this gorgeous card! Love the flowers!